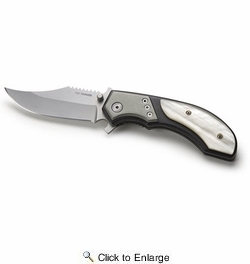 � Overall length: 7.5", closed 4.5"
Titan 12113 Black Stainless Steel And Aluminum Handle With Gray Resin Trim - Hunting knife style blade with bone saw, bottle opener and curved edge for skinning. Blade locks in open and closed positions for safety. Handy belt clip.